We’d love your help. Let us know what’s wrong with this preview of SUSPICION by Brenda Guiton. A lightning romance and hastily arranged marriage takes Holly up north to live at the heart of Nathan's family business - a luxurious log-cabin park on the edge of the Yorkshire Dales. She has everything to look forward to, but within days of her arrival she falls prey to a series of unsettling events. It is obvious that someone doesn't want her there. It all points to Kyl A lightning romance and hastily arranged marriage takes Holly up north to live at the heart of Nathan's family business - a luxurious log-cabin park on the edge of the Yorkshire Dales. She has everything to look forward to, but within days of her arrival she falls prey to a series of unsettling events. It is obvious that someone doesn't want her there. To ask other readers questions about SUSPICION, please sign up. It is said that we all have a secret in life. Something from our past which we really do not want anyone to find out. It could simply be a silly and embarrassing incident. Or perhaps it could be much darker and sinister in nature- something which we would stop at nothing to hide from others. However, the problem is that virtually nothing remains concealed forever. It all eventually leaks out like a sieve. The question then becomes how on earth do we react when this deep, dark secret is at It is said that we all have a secret in life. Something from our past which we really do not want anyone to find out. It could simply be a silly and embarrassing incident. Or perhaps it could be much darker and sinister in nature- something which we would stop at nothing to hide from others. However, the problem is that virtually nothing remains concealed forever. It all eventually leaks out like a sieve. The question then becomes how on earth do we react when this deep, dark secret is at risk of being exposed? Will we take it all in stride? Or will we double down in our desperate efforts to maintain secrecy...whatever it takes! If these concepts intrigue you, then Suspicion by author Brenda Guiton will be right up your reading alley! The story begins with our protagonist, Holly, discovering love in the form of a handsome thrill seeker by the name of Nathan. The two have a whirlwind romance and quickly become married. Their plans are to settle at Nathan's beautiful, family run log-cabin park. Sounds like the perfect outcome for a love at first sight romance does it not? Unfortunately, things are not at all what they seem to be. Almost as soon as she arrives at her new idyllic home, peculiar things begin to happen. What is even more unsettling is the fact that they are all directly tied to Holly. Someone is clearly not very happy with her arrival, and Holly is pretty sure she knows who that "somebody" is. Nathan's surrogate brother Kyle seems to be at the root of these series of malicious and unfortunate events. What's worse is the fact that he seems to have some sort of unnatural hold over Nathan. A grip which Holly is totally unable to undo. After investigating for herself why this is the case, Holly finds out that there is much more to all of this than meets the eye. In fact, a missing girl cold case mystery may somehow be inexplicably connected. Will the mystery ultimately be solved so that Holly and Nathan can enjoy their life together? Or was their fate already decided long ago? I found the plot of this novel to be fast-moving and thrilling. I always felt somewhat on edge as I was reading, which can be attributed to the suspense and tension which is skillfully created and built up throughout the story. The theme of trust and secrecy is brilliantly supported by the user of such literary devices as foreshadowing and flashbacks. In fact, I am usually not a big fan of flashbacks as I often find them somewhat confusing and can tend to disrupt the flow of the story. However, in this case I believe they were used exceptionally well. They actually enhanced understanding and connection with the novel's current events as opposed to detracting from them. The entire plot structure is presented in a unique fashion which makes the story quite easy to follow and become immersed within. There can also be very little doubt that the characters play a huge role in the development of this story. While Holly, Nathan and Kyle play the primary roles, there are a number of others who aptly support their growth. They ultimately provide key information about their interactions with one another which allows the reader to reach a deeper understanding about the story events. Each of the main characters experience significant growth by the end of the book. In truth, none of them resemble who they started out as in the beginning. This is truly character development at its best. I suppose in this case we could call it "character metamorphosis". Overall, I quite loved Suspicion. It had all the elements a reader would look for in a top-notch thriller and mystery novel. It will undoubtedly keep you guessing right until the very end. I would highly recommend it to an adult audience. Meaning that I expected suspense, secrets and something dark and psychological, but what I didn’t expect is how effortlessly the plot would zoom me forward and how engrossed I would be, right from the opening pages. I finished this easy-to-read suspense novel in less than a few hours. It wasn’t high-octane action; instead it was a masterful and deliberate psychological buildup all the way to the final page. The use of profluence and foreshadowing was excellent. It was just enough to keep me on edge and always wondering what might happen next. A self-employed British web designer named Holly goes to visit her mom and her boyfriend Charlie in Spain at their new villa in Jerez, only to meet someone who changes everything for her. She is spontaneous and life happens when she falls in love with Nathan, a British man from “The Dales” who was also on holiday. Although Nathan was written as the handsome, athletic archetype with the beautiful eyes and the whole dreamboat package, there is something about him that seems to be a little too good to be true. Knock me over with a feather when we find out the truth. There is interplay of expectation or fantasy when Holly and Nathan get married very quickly and she’s back in the U.K. at his family’s compound of vacation cottages as his wife. The initial meeting with Nathan’s family becomes weird and disturbing after she meets his brother Kyle. The brothers are physical opposites and seem to be different in attitude as well. They are extreme sports fanatics and basically spend all their spare time rock climbing, hang gliding and act almost like identical twins, which they most definitely are not. Kyle reminded me many times of someone I once knew, he was also extremely jealous, prone to angry fits and always lurked, rather than walked on by. Kyle’s sexuality is also in question, so he comes off as conflicted and secretive. That aspect alone doesn’t make someone good or bad in any way, but it does pose the question of him possibly having a shadow life. His character never feels authentic or honest to the reader and is about as unreliable as you can get. These character details also make the reader wonder what else he might be capable of when a few more “accidental” things occur in the novel. He doesn’t like Holly and makes it quite clear from the first moment they meet with snarky and rude comments that are thinly veiled by a charm he exudes that seems to dissuade others from seeing his immature fits, while engaging in extreme drinking binges with his brother. What made this interesting to observe was how Holly saw right through Kyle’s manipulations, but no one else did, so she was on her own to figure things out. Families are always complicated and an outsider can change the dynamics, as it seems Holly did when she showed up and learned that more than a few things in her new situation might be quite different that what she’d expected. The turmoil of dealing with huge lifestyle changes, new living arrangements and the stress on a woman who is independent and unused to family drama was written spot on. Holly was a strong character who took things in stride, even when Nathan defended his brother more often than her side of it, but she also listened to her gut. I can’t say more without spoiling it––if she was right or not about her “Suspicion,” but she was definitely on to something. Even more interesting, when a terrible secret from the past comes to light, it isn’t who you think it is that instigated or created the situation. The tragic twist at the end was well done and it truly took me by surprise. Anyone who likes a good mystery with lots of suspense and has ever experienced a romantic situation where they were triangulated or always made to be the odd person out––would totally get into this story that talks about the hazards of falling in love too quickly, family, dark secrets and how lies can compile and shift the future for everyone involved. Things are not always as they seem to appear. Such is the case in this tight, well written mystery about life, love, death, and relationships. Holly is swept off her feet when she meets Nathan, a good-looking, Xtreme sports enthusiast. They quickly feel that they each are what the other needs, so much so, that they follow their hearts with a quick decision to marry. The promise of a fairy tale marriage, living in a beautifully renovated home located amongst the luxury log cabin park owned by her Things are not always as they seem to appear. Such is the case in this tight, well written mystery about life, love, death, and relationships. Holly is swept off her feet when she meets Nathan, a good-looking, Xtreme sports enthusiast. They quickly feel that they each are what the other needs, so much so, that they follow their hearts with a quick decision to marry. The promise of a fairy tale marriage, living in a beautifully renovated home located amongst the luxury log cabin park owned by her husband's family, gives Holly the feeling that everything will be perfect. ... And then she meets Kyle, Nathan's brother. Although not brothers by blood, Nathan and Kyle share a tight, brotherly bond that immediately begins to interfere with Holly's perfect dream marriage. Holly finds it near impossible to break the bond shared by the brothers, feeling that Kyle is purposely trying to sabotage her relationship with Nathan. Meanwhile, Nathan thinks she is too suspicious of Kyle’s true intent. As time progresses, it becomes evident that Nathan has not been honest with his new bride regarding indiscretions from long ago. He and Kyle share a life changing secret that they’ve been harboring for 12 years. Not one to be shut out of her own marriage, Holly digs into the past through her own investigation. What she finds, sends her thoughts into a tailspin as the lies start to compound until there appears to be no way out. I’ve loved mysteries since my Nancy Drew days and truly enjoyed Suspicion. The title intrigued me because it’s also the name of Alfred Hitchcock's psychological thriller starring Cary Grant and Joan Fontaine. Both are riveting tales about new brides whose dreams of happily-ever-after run headlong into their husbands' secrets, but the similarities end there. 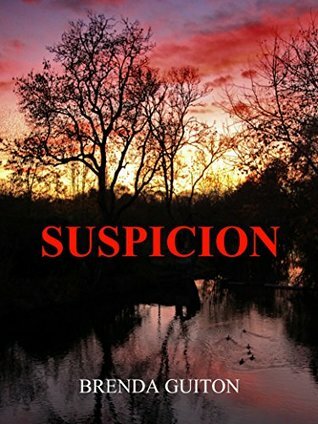 Brenda Guiton’s Suspicion is well written and expertly paced; the narrative speeds ahead like a bullet train and never lags. From the opening I’ve loved mysteries since my Nancy Drew days and truly enjoyed Suspicion. The title intrigued me because it’s also the name of Alfred Hitchcock's psychological thriller starring Cary Grant and Joan Fontaine. Both are riveting tales about new brides whose dreams of happily-ever-after run headlong into their husbands' secrets, but the similarities end there. From the opening chapter I was intrigued by the story of Holly, a smart, independent web designer who falls head-over-heels in love with Nathan, who she meets on a plane to Costa de la Cruz and decides to marry two weeks later. It seems like a dream come true—until they begin their life together at a resort run by Nathan's family in the picturesque Yorkshire Dales. The first sign that something is seriously amiss is the chilly reception Holly receives from Kyle, Nathan's best friend and surrogate brother. The author does a great job of keeping readers guessing about the true nature Nathan and Kyle's intense and complicated relationship. But when a tragedy from the past resurfaces, Nathan and Kyle's composure and relationship begins to unravel. What started as a love story takes a serious turn and soon becomes a nightmare for Holly who is desperate for answers on who her husband and Kyle really are and what they have done. Brenda Guiton lives with her husband, Derek, in South Yorkshire. Since retiring, she has had three short plays performed at The New Bradford Playhouse (formerly The Priestley Theatre). One of the plays, "Out of the Confusion" was also broadcast on BCB (Bradford Community Broadcasting) and adapted as an Internet audio book. Following an interesting and diverse career, Brenda devotes her leisure time Brenda Guiton lives with her husband, Derek, in South Yorkshire. Since retiring, she has had three short plays performed at The New Bradford Playhouse (formerly The Priestley Theatre). One of the plays, "Out of the Confusion" was also broadcast on BCB (Bradford Community Broadcasting) and adapted as an Internet audio book.